Is there a scientific explanation for “changing bodies”? 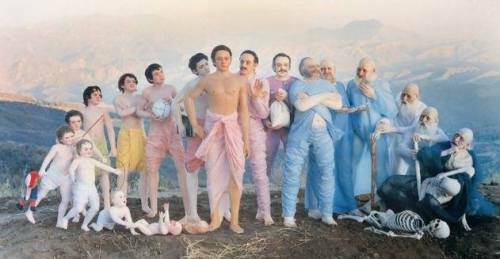 Question: Is there any scientific explanation for the concept of changing bodies? Could a spirit soul transfer to a completely different universe or dimension? Does the soul remain in the body after death for any amount of time? Our Answer: Anyone can prove to themselves, using scientific methods, that they perpetually remain the same conscious entity while the body perpetually changes. It’s simply a matter of hypothesis and observation. Depending on what kind of science you accept as valid, the Bhagavad-gita gives a thoroughly scientific explanation of transmigration of consciousness through different bodies, especially in the eighth chapter. You may also want to examine Dr. Ian Stevenson’s three thousand case studies of children remembering past lives. 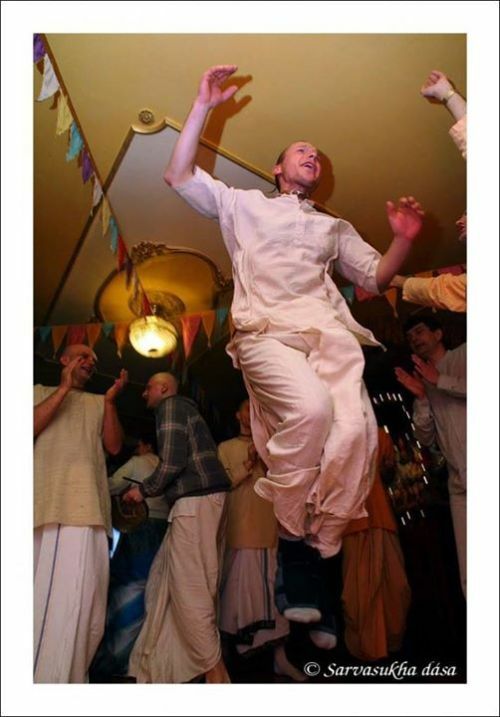 Kadamba Kanana Swami: The family of vaishnavas is somehow or other our support. Prabhupada made this movement a very personal one. In the beginning, we overlook how important relationships are because we are not used to it. In the material world, when a relationship does not work, you just cut it off and try another one… then another one and another one. Balabhadra, Baladeva and Lakshmi on the Gita Nagari Farm in 1981. 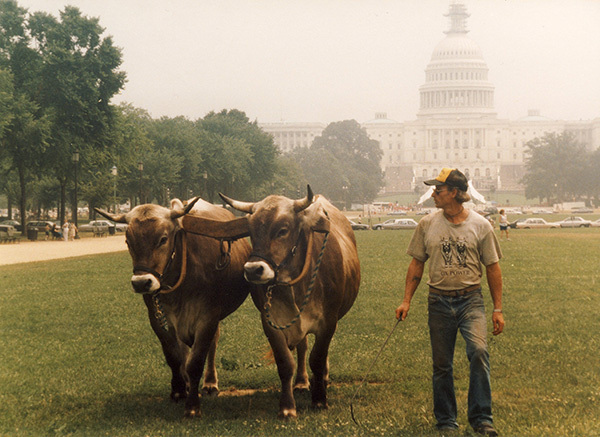 In the mid 80’s the farm started a program called “ADOPT-A-COW” which was to raise funds to help support the cows. By that time we had a herd of 157 cows and it was way to many cows for the land that we had to work with. 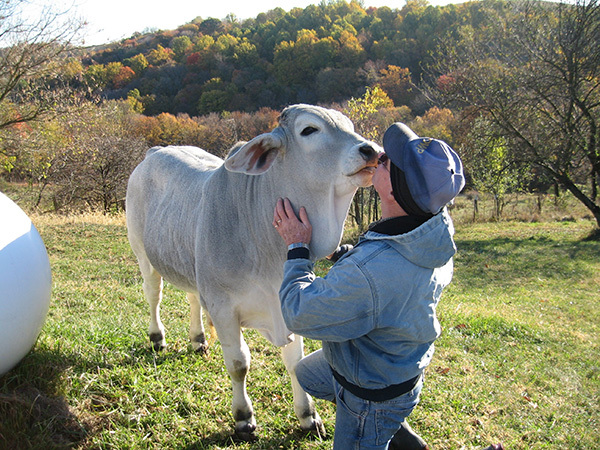 We were the 1st ISKCON farm in North America to stop breeding along the commercial dairy way of doing things. It was realized that if you are not killing your unproductive cows and male offspring as a commercial dairy does, then you lose your economic profit. So it was necessary to raise funds to pay for the feed that we could not grow on the farm. My wife and I ran the “ADOPT-A-COW” program from 1988 to 1990. During this time we also were in charge of the agriculture department on the farm. It was during the celebration of Govardhan Puja and Go Puja in 1989 that a devotee by the name of Adwaita Chandra paid us a visit and had an idea that he wanted to discuss with us. 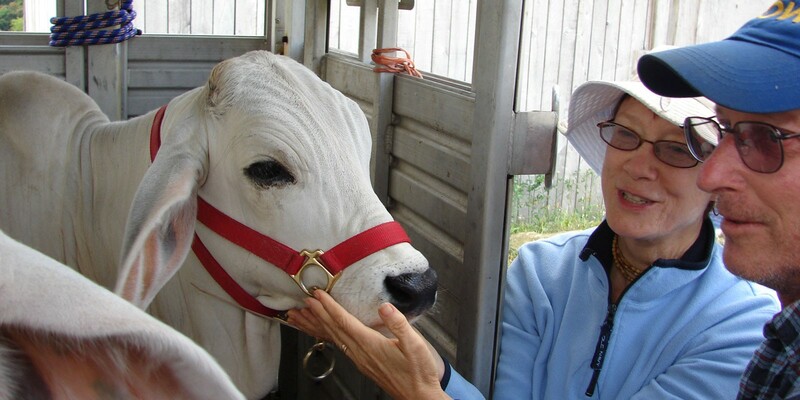 At that time each of the North American ISKCON farms each had a cow protection program. There was “ADOPT-A-COW,” “SAVE A COW” and “MOTHER COW,” each dealing with a specific herd of cows. Adwaita Chandra’s idea was to develop a cow protection program that was universal in application, global not regional. We talked for many hours over that weekend and came up with the name of “INTERNATIONAL SOCIETY FOR COW PROTECTION’ as well as a basic list of goals that have since evolved into the present day goals of ISCOWP. We parted company after the festival and he said, “Think it over and if you want to go ahead with ISCOWP, go ahead.” He is an idea man, consultant type of person, not a cow man or farmer. We decided to organize ISCOWP as a non-profit charitable incorporation. We legalized everything in March 1990. 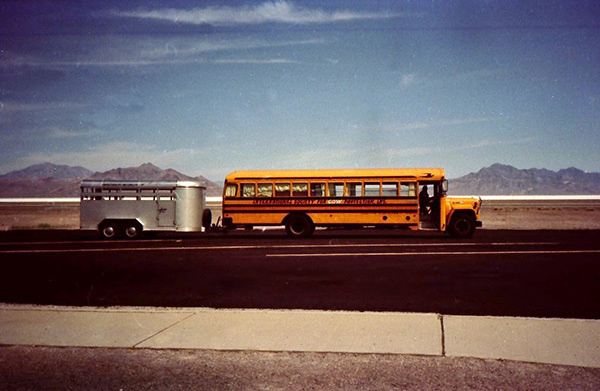 ISCOWP traveling by Salt Lake, Utah. 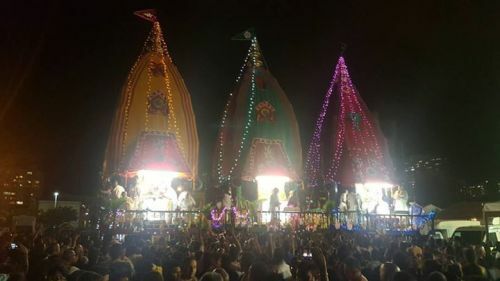 The spring of 1990 we started traveling to all the North American Rathayatra festivals, the Earth Day Festival, and other programs. We took a team of oxen and led the Ratha Yatras during the parades. 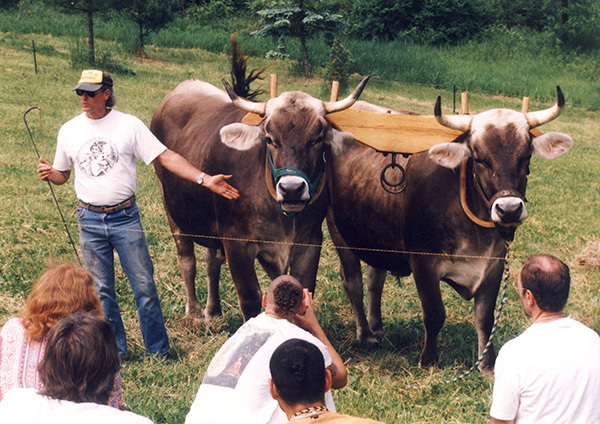 At the festival site we would have the oxen available for people to pet, touch, and photograph. The festival visitors were completely in awe of the beauty and size of the oxen. We also had a booth where we sold t-shirts, distributed literature, and had many pictures of the farm and what the oxen did at the farm. 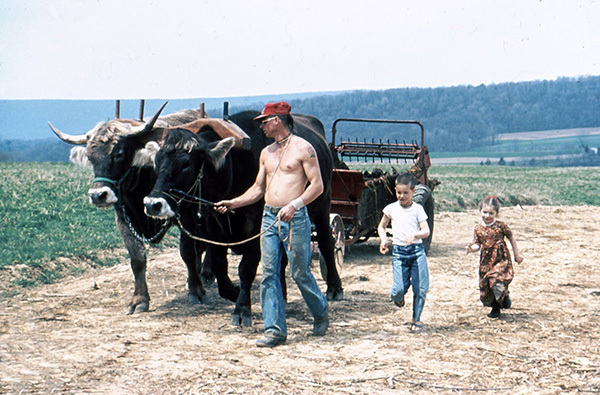 “THE OX IS THE BACKBONE OF THE FAMILY FARM, NOT THE SOUP BONE” was one of the slogans that we used to show the usefulness of the oxen in our lifestyle. We did this for approximately 4 summers in which we received positive press coverage throughout the USA. In the meantime we acquired some small acreage (3 acres) in North Carolina to establish a small family farm. The team Vraja and Gita and teamster Balabhadra in front of the USA capitol, Washington DC. Beginning in 1990 my wife, Chayadevi, began writing and publishing the ISCOWP quarterly newsletter. This newsletter is still printed today. She also started a children’s newsletter and materials but could not find many persons to subscribe, so it was discontinued. Chayadevi does most of the correspondence, fund raising, accounting, photography, curriculum development, designing of original ISCOWP T-shirts and display paraphernalia. 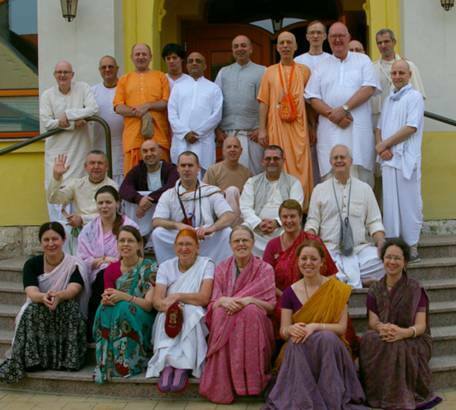 In 1993 she began the ISKCON COM cow conference that had approximately 90 members from about 20 different countries. The cow conference formulated cow protection standards that are now ISKCON Law 507 so that mistakes aren’t made and repeated in cow care facilities. Since the beginning of 2005, we have not been active with the cow conference. Now we have a presence on the social networks: Facebook, YouTube, etc. 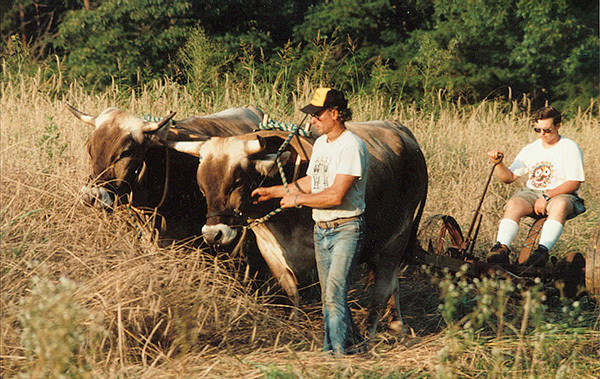 Planting wheat with ox power on the North Carolina property in 1992. 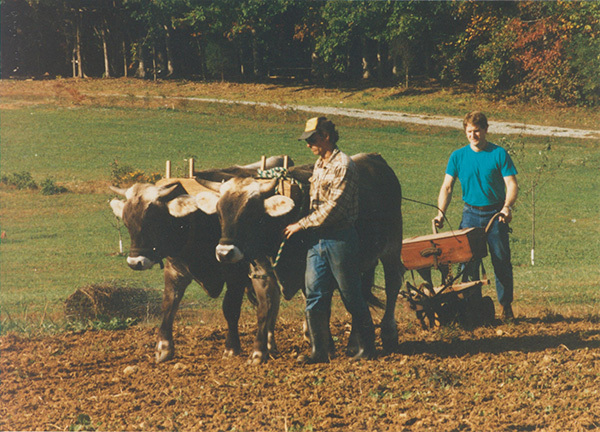 On the 3 acre North Carolina property we acquired in 1991 we grew wheat, rye, and vegetables with the help of the oxen only, no machines. Eventually we found this acreage to be too small for our family, 2 oxen, and the crops we wanted to grow. A friend of ours had bought a large parcel about 2 hours away in which there was approximately 20 acres in bottom land. An oral contract was made that we could cultivate that property to expand our program. There was no electricity, no water system, and the land had not been worked for years. I lived there in our school bus that we used to travel coast to coast with the oxen and began to cultivate the land with our ox team, Vraja and Gita. We developed a hand water system drawing water from the nearby stream. The living situation was austere. Oil lamps for electricity, hand pumping all water, and living in the school bus that had no facilities but shelter. Here we grew large vegetable gardens, dry land rice, wheat, and rye. No machines were used for farming or living on this property. Mowing rye with ISCOWP ox team Vraja and Gita at Prabhupada Village in 1993. For approximately 3 years we cultivated this land until we received an invitation in the beginning of 1995 to live at New Vrndavana and join Varsana Maharaja’s disciples work towards self-sufficiency. It was proposed I would teach the younger devotees the skills I knew so they could get established on the land. 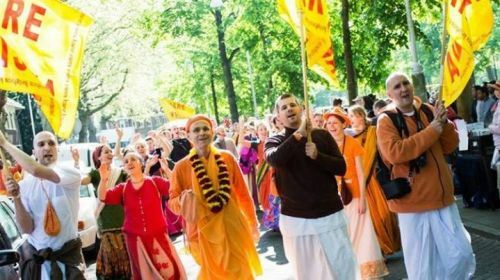 We were enthused to make the big move so that we could gain energy and association on the path to establishing cow protection as Srila Prabhupada desired. Balabhadra and ox team Vraja and Gita teaching the “How To” and philosophy of ox power at New Vrindavana, West Virginia. We sold our 3 acres, our trailer home, and made numerous trucking trips long distance to move all the ox equipment and household to New Vrndavana. During the first year we trained approximately 10 teamsters and 20 oxen from the New Vrndavana herd. Due to financial difficulties of the New Vrndavana administration our project could no longer receive strong support from New Vrndavana. At this point we had the opportunity to purchase land from New Vrndavana as they were selling land to minimize their financial pressures and to attain funds for expenses. 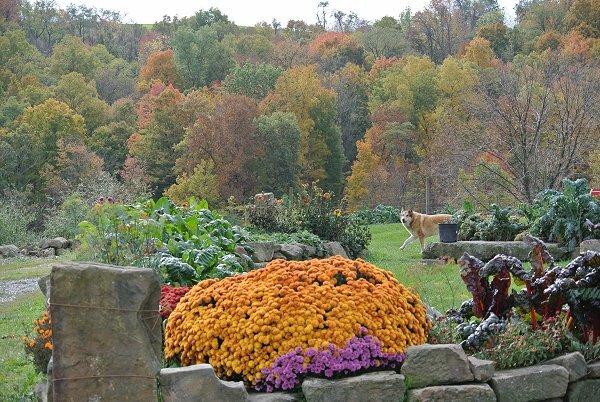 In 1996, we acquired a 57 acre parcel which was the heart of an old family farm. The devotees had worked it about 15 years ago. Some of the buildings were still standing but most were not in good repair. Numerous springs, a stream, pastures, and forest were some of the features that attracted us to purchase the property. 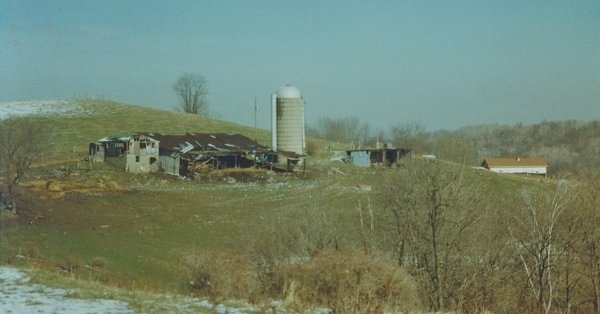 Part of ISCOWP Farm property in West Virginia in 1996 when it was first bought. Building to the right was being built by ISCOWP for living quarters. In 1998, I was appointed the ISKCON Minister for Cow Protection and Agriculture to advise and instruct ISKCON centers and devotees protecting cows. To this end, ISCOWP and the members of the cow conference created the Minimum Standards for Cow Protection which is ISKCON Law 507. I traveled to various ISKCON centers and cow protection projects worldwide for the purpose of establishing these standards and distributing cow protection knowledge. It was my pleasure to also acquire knowledge through these travels. In 2012, I resigned from this position due to on-going, unresolved health problems..
Part of ISCOWP Farm in West Virginia 2015. 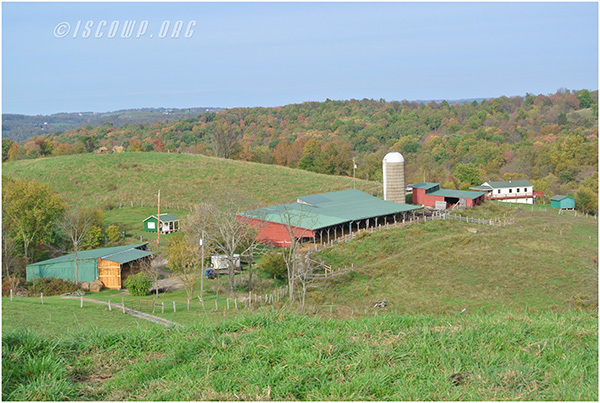 In the last 19 years we have been working to establish ourselves on the ISCOWP Farm. We have built two modified earth shelter homes and one cabin for trainees, refurbished the old standing barn, built a new barn adjoining the old barn, built a hay barn, a geriatric barn and an equipment storage/workshop building, installed new fencing (ongoing process) and a new water system, reclaimed the pastures from rose bush weeds (ongoing project also) and removed truckloads of garbage. Twenty-four cows and oxen (mostly rescues) reside here protected and loved in a beautiful environment. Since 1996 we have acquired two adjoining parcels and another parcel that will make the land holding 165 acres. Now we have more facility for the cows and oxen. Ridra protecting one of the gardens full of chard, kale, spinach strawberries, peas etc. from predators. We have been growing much of our food and preserving it by canning and drying. There is a big deer and groundhog population here that tries to eat much of the garden. A very important resident, Rudra the dog, guards the garden and has been quite successful in scaring off the wild animals. However, the deer became so profuse that we built a 9 foot fence around the 1 acre garden with the help of our donors. We have come to realize that no matter how many cows one can rescue, save and care for, there will be thousands more suffering and in the need of love. Both the meat and commercial dairy industries make profit from exploiting the cow, her brothers and her children. If you can become vegetarian and not take milk from the commercial dairy industry but only from life-protected cows (Krsna – Dairian), then you are contributing to lessening the demand for meat and commercial dairy products. The less demand the less the supply and the less suffering for Mother Cow. One person’s diet change a drop in the bucket? That is why we feel education is so important to saving more cows. Many people do not realize the correlation between diet change and saving cows. Once people understand the correlation and how much Mother Cow is suffering because of the meat and diary industries, they will be encouraged to make a diet change. Our goal is to not only protect the ISCOWP herd but to spread information about diet change and the need for cow protection. We are looking forward to hearing from you at: iscowp@gmail.com. and please feel free to explore this website. – Outing to Florence. We will meet interesting people and visit amazing places.